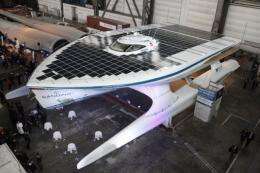 The solar powered boat "PlanerSolar" is presented at the HDW shipyard in the northern German city of Kiel. The vessel will be able to achieve a top speed of around 15 knots, equivalent to 25 kilometres (15 miles) per hour, and can accommodate 50 people on its round-the-world voyage, its Swiss-based makers say. A skipper hoping to become the first to sail round the world using solar power said his catamaran could carve a wake for pollution-free shipping as he unveiled the record-breaking yacht Thursday. "This is a unique feeling to see in front of me today a boat which I so often dreamed about," said Raphael Domjan as the covers came off the 18 million euro (24 million dollar) boat, the world's biggest solar-powered vessel. Domjan will launch PlanetSolar in late March before starring at Hamburg port's 821st anniversary celebrations in May and undergoing testing between June and September. The world tour will then start in April 2011. Silent and clean circumnavigations of the planet were achieved centuries ago using sail power, and the team behind its construction acknowledge that solar power is not about to become the main power source on modern cargo ships. They say they want to use the voyage primarily to promote solar power and other non-polluting sources of energy, and to show what can be done. "The aim is really to show that we have the technology today, not tomorrow. It's not in a laboratory or DIY, it is a technology that is reliable, able to perform and economically interesting," Domjan, 38, told AFP. "We're not saying that all the world's boats could be solar-powered ... But along the Equator there are lots of fishing boats, lots of boats that only sail for a few hours, and it would be perfect for these to be solar-powered." The two-person crew on the 60-tonne PlanetSolar plan to stick as close as possible to the Equator in order to maximise the amount of sunlight to power the vessel. Dozens of other passengers, including journalists and environmental campaigners, are expected to join the voyage at various stages. The roughly 40,000-kilometre journey is expected to last around 140 days, with organisers assuming the boat can keep up an average speed of around eight knots. The planned route foresees the boat crossing the Atlantic Ocean, slipping through the Panama Canal, crossing the Pacific and then the Indian Ocean, before passing through the Suez Canal into the Mediterranean. Stopovers are planned along the route including in New York, San Francisco, Darwin in Australia, Hong Kong, Singapore, Abu Dhabi and Marseille in southern France. With the boat scheduled to go round the pirate-infested waters off the Horn of Africa on its approach towards the Suez Canal, however, organisers said they might send it around the Cape of Good Hope instead. It's not a catamaran, which has two hulls, but a trimaran with two surface piercing side hulls, judging by the anti-fouling. But who knows? The glare from the panels is going to be a nightmare for the crew.